Seeking low maintenance landscapes – people have turned to the lowest common denominator for greenery and installed what is called “plant material”. “Stick in a few river birches and some spiky grasses to “soften” the corners and we’re all good. “Heaven forbid we plant something that might bloom,” says bee watcher and author Rhonda Fleming Hayes. If pollinators are on your list season, please consider Rhonda Hayes Fleming as a source. 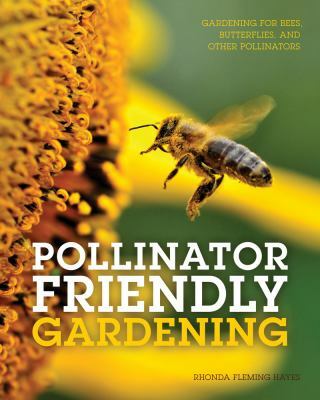 Her 2016 'Pollinator Friendly Gardening' documents her journey as both a bee watcher and ultimately a bee and pollinator gardening evangelist. Fleming ripped out her existing Minneapolis lawn and landscape and devoted the new plan to bee, butterfly and hummingbird super-foods. The trick was convincing the neighbors a weedy mess would not ensue and a yard dedicated to clover (an American most-wanted weed) was a brilliant idea. “Convince the neighbors the design is intentional,” she says. • Design a garden pulling from a minimum of three consistent blooms per season, grown in drifts in groups of odd numbers. “Keep your palette simple to avoid a chaotic look,” she says. • Fleming took on a holistic approach to pollinator gardening in the year 2000 – she ignored plant tags, she questioned everything with an eye towards pollinators. • Using a top down approach to design – Hayes provides a plant list that reads like a greatest hits in support of bees, butterflies and hummingbirds. Her own garden is a season-long buffet of overlapping blooms – hedges, thickets, flowering groundcover, understory trees and stately trees, mixed with brightly colored perennials with places to feed, hide, rest, and drink. • A mixture of pollinator-friendly (native and non-native) ground covers, annuals, perennials, ornamental grasses, evergreens and shrubs. • A variety of rocks providing nooks and crannies for pollinator shelter and nesting. • Minimal mulch that also allows for nesting sites for wild bees. • Generous front porch serves as my summer office, plus entertaining area. I plant "bait" (pollinator favorites) nearby so I can observe them up close from porch. Fleming loves to spread the message of “Bee Superfoods”… foods connected to the yearly event known as nectar flow or those plants that bees count on in spring to fuel their reproduction and then later winter survival. All with an eye toward “easing the neighbors” into the new plan and vision. She understands this is an aesthetic departure from landscaped America. “There are lots of well-behaved natives that won't offend the neighbors or require their notification,” she says. “I’m just hoping flowers become hip again,” she says.